I hope that everyone is enjoying the day off. The temperatures for tomorrow are supposed to be cold so we have revised the Youth Skiing Wrap-up. We will ski on Tuesday from 3:30-4:45. We will then head over to the Memorial School in North Yarmouth for some pizza to celebrate the season. I realize that driving to N. Yarmouth may be inconvenient for some but that was the only place where we could find space. The event will take place in the multipurpose room. We’ll hopefully be done around 6:00. Please see the note from the previous post about RSVP. Thanks and see you on Tuesday! 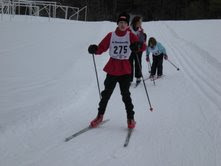 Next Tuesday, March 3rd, will be the last day of the Cumberland Youth Skiing program for the year. We'll start the session at 3:30. Around 4:15, we'll stop and have pizza and whatever else to celebrate the season. We'll do this under the veranda at the new red building at Twin Brook, where we always meet. For parents who have not come out to ski, please come, whether by ski, snowshoe, or foot. This will be a great opportunity to observe what we've been doing this winter and I'll think you'll enjoy it. Please RSVP by calling Cumberland Recreation at 829-2208 on Monday or Tuesday. Also, feel free to RSVP via email to sdavis@cumberlandmaine.com. In the event of extreme weather, like rain, we'll move it to the gym at the Memorial School in North Yarmouth. As of now, the weather is predicted to be around 30 degrees with some snow showers. This will be conducive to having the event at Twin Brook. If the weather changes, drastically, I'll email by noon Tuesday. I hope that everyone had a great vacation week. I heard that a lot of families were going on some great trips. It should be a good week of skiing. We'll wrap things up next week either on March 3rd or March 5th. We may try to do some type of get together. Details will follow. Have a good rest of the week and I hope that power has been restored. This is a repeat of a message I sent a week or so ago. With a February 1 deadline coming up, I thought I would send out a reminder. If you are interested in this event, I would encourage you to registerbefore February 20th so that you avoid a late fee. You should also make a reservation at theCrowne Plaza as soon as possible. Be sure to call them directly and ask tomake a reservation for the festival (don't go to central reservations--they will send you back to the hotel). What is the Bill Koch Festival? It is a fun weekend of skiing for skiersborn after 1994. There are competitive events--an individual classic raceand a skate relay race, as well as non-competitive skiing--themini-marathon. For the youngest skiers, there are the lollypop races.There are kids from all over New England that come together to celebrate Nordic skiing. The actual events start on Saturday morning, but most people try to arrive at the festival site by Friday afternoon, hopefully in time to check out the courses. Most people will stay at the Crowne Plaza in Pittsfield--there is a pool there and the Saturday night Pasta Dinner and awards are held there. Inaddition, they set up a waxing room and are essentially the event headquarters. You can find out all of the lodging options at the festivalwebsite. Our family went to our very first Bill Koch Festival in 2001 at Notchview. I remember the weekend vividly. 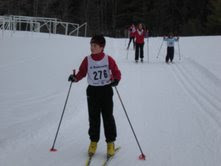 Jackson skied in the lollypop race and thenskied in a relay as well. Carter spent most of the weekend skiing around avery short loop in the woods where they had decorated the trees with all sorts of trolls. Four years later, we returned and they were both racing in all of the events. When you register, they will ask you for your club. If you are in the Cumberland, Freeport, Falmouth, Yarmouth, North Falmouth area, I would encourage you to sign up as part of Coastal Nordic. 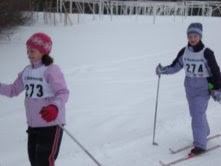 If you are from CapeElizabeth, your club is Cape Nordic. When they ask what district you arefrom, it is SOME (Southern Maine). I know that western Massachusetts sounds like it is a long way away fromsouthern Maine (and it is about a four hour drive) and you might bewondering about snow in Massachusetts. Well, the best snow we have had atthe festivals were the two festivals at Notchview, the one at Stowe and lastyear at Gunstock. Hopefully, we will have a good group of skiers from southern Maine attendingthis year. Morgan Laidlaw will join us as well for coaching and support! Practice is on this week. We will freestyle both days this week. No practice next week on the week of Feb Vacation. Wow--what a time we had out there at Twin Brook today. Forty-eight youthskiers ranging from 4 to 14 years old skied all over Twin Brook's trails ona scavenger hunt. The kids picked up tokens and candy in the woods andturned them in for all kinds of prizes at the end. It was great fun seeing everyone out there skiing--kids and parents! Thanks to everyone for bringing the prizes and special thanks to PeakPerformance in Portland for donating ski ties, water bottles and posters tothe prize table. Thanks to all of the parents who helped out on the courseand at the prize table. Next week's event--the 2nd annual Tennis Ball Biathlon, Sunday, February8th. Registration between 11:00-11:45; race begins promptly at noon.Registration fee is $2.00. Skiers will ski a short loop, stop and shoot tennis balls through a hulahoop, ski a second loop, come in and shoot tennis balls again and thencomplete a final loop. This is a SKATE ski race. Anyone eighth grade and younger is welcome. There will be a special coursefor the lollypop racers (under 8 years old).